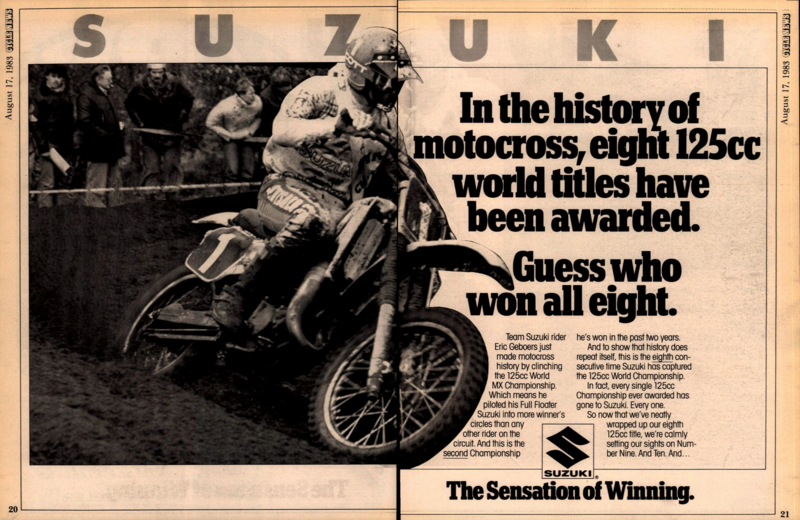 Suzuki's Eric Geboers clinched the 1983 FIM 125cc Motocross World Championship in Sweden, extending Suzuki's streak to all eight of the world titles that had been won in the class since it was founded in 1975. 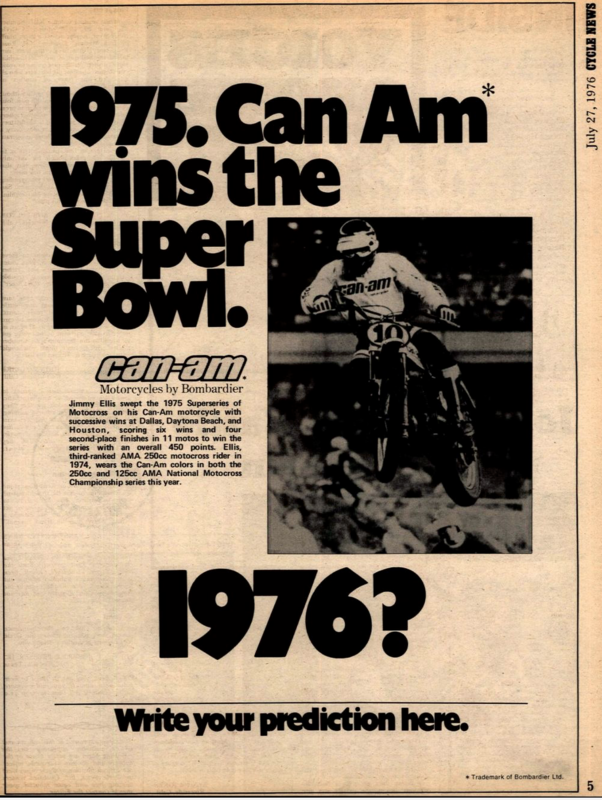 Can-Am's Jimmy Ellis was undefeated in the four-race 1975 AMA Supercross Championship, and the Canadian bike-maker was feeling like he was going to be hard to beat in '76, especially at the Los Angeles Superbowl of Motocross—they even bought a pre-race win ad of sorts, as you can see below. And when the starting gate dropped (in front of a record 73,130, according to the stadium's scoreboard), Ellis did exactly what the company expected him to do: go out and win the main event. Suzuki's Tony DiStefano would finish second, and Honda's Pierre Karsmakers third. At the 500cc Grand Prix of Britain at Farleigh Castle, series points leader Hakan Carlqvist went 1-1 aboard his Yamaha, with Honda's Andre Malherbe and Suzuki's Harry Everts rounding out the podium with 3-2 and 2-3 finishes. The big Swede Carlqvist would go on to win the 500cc crown vacated by American superstar Brad Lackey after the #1 rider could not find a proper ride for a title defense. Also in '83, Canada would host a 250cc Grand Prix the week before the USGP at Unadilla, and the winner in both motos was KTM rider Kees Van der Ven—the same man who won Unadilla the year before. Suzuki's Georges Jobe finished second and Yamaha's Danny LaPorte tied for third with rising Canadian star Ross "Rollerball" Pederson. 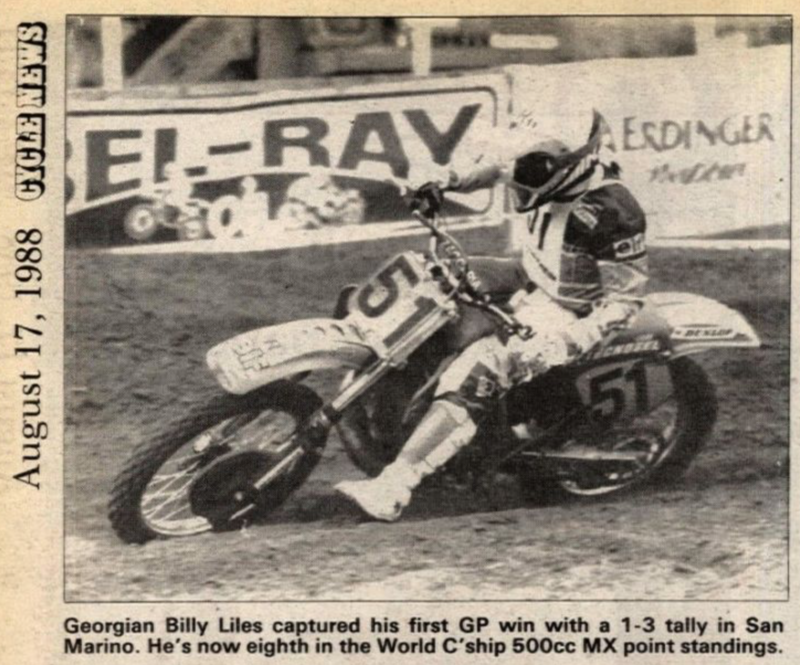 Georgia's Billy Liles, an ex-pat racing in Europe, won his first 500cc Grand Prix in San Marino with 1-3 moto scores. Liles, who was a charter member of Kawasaki Team Green and once won a 250 National in the states, had emigrated to Italy to find a ride, and he ended up on a Kawasaki in 1988. Following him was soon-to-be-crowned FIM 500cc Motocross World Champion Eric Geboers. At Kenworthy's in Troy, Ohio, Kawasaki's Mike LaRocco out-dueled Honda's Jeremy McGrath with 3-1 and 1-2 scores. Behind them was six-time AMA Supercross/250 Motocross Champion Jeff Stanton. As Stanton had already announced his plan to retire at the end of the season, the Kenworthy's podium would turn out to be the last of his career. Suzuki's Damon Huffman topped the 125 Class, with Honda riders Doug Henry (the defending 125 National Champion) and Steve Lamson rounding out the podium. There was another undefeated summer ahead for Ricky Carmichael, though this time, he wouldn't win every moto. RC won Thunder Valley with 1-1 moto scores aboard his Makita Suzuki RM-Z450. Factory Connection Honda's Kevin Windham went 2-2 for second, and Chad Reed went 3-3 for third. In the 125 Class, Monster Energy/Pro Circuit Kawasaki's Ivan Tedesco was chasing after his first AMA Motocross Championship, and he also went 1-1 to top the 2-2 of Honda's Andrew Short, the crowd favorite in Colorado, and Factory Connection Honda's Josh Grant. This was the first visit to David Clabaugh's Thunder Valley circuit, which took the place of Kenworthy's in Ohio on the national schedule due to the unpredictable floodwaters that had wreaked havoc on Kenworthy's two years earlier. By all accounts, it was a success, and it's remained on the AMA Pro Motocross schedule ever since. It also hosted the Motocross of Nations in 2010.